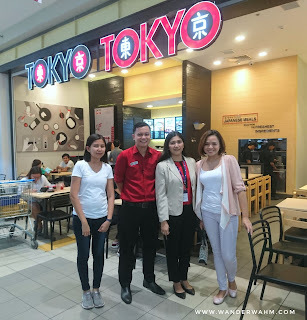 A few years ago, Tokyo Tokyo made a hole in my heart because of their sudden closing at SM City Batangas. The nearest Tokyo Tokyo was at Lipa and a bus ride is needed to get into there actually. But last May 29, Tokyo Tokyo is back in town! 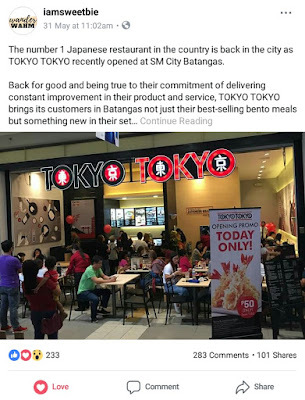 I was giddy excited seeing that their outlet is the newest at SM City Batangas. The last time I had a bento meal was with my husband, dated February 2016. Prior to that was February 2015 with my sister-in-law. Funny isn't it? And now that Tokyo Tokyo opens its door once again to Batangueños, I didn't let this chance pass to savor again with a bento meal. The place is quite small compare to the previous location but as of now there's nothing more I could wish for as long as I can have my Teriyaki Wings once again and the famous Red Iced Tea. No meal in Tokyo Tokyo is complete without their signature Red Iced tea. WHAT IS A BENTO MEAL? 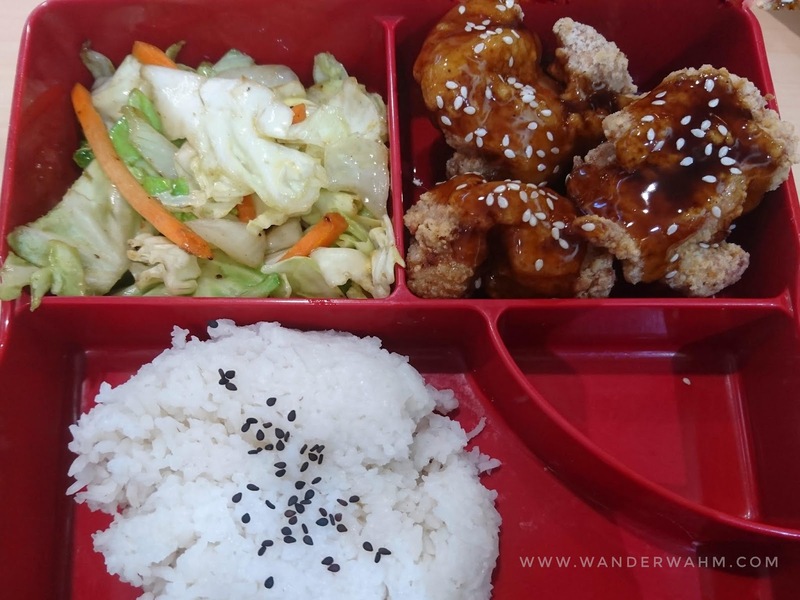 The traditional Bento Box comes with a generous serving of rice, fish or meat, vegetables, and even dessert making it a complete and enjoyable Japanese meal! In Japan, Bento Boxes are fully packed Japanese meals good for one person. Tokyo Tokyo's Chicken Karaage or Japanese style fried chicken coated with our signature teriyaki sauce. Served with vegetable misono and unlimited rice. This was my meal before with my husband but I want the Teriyaki Wings back then. The Chicken Karaage is soft to chew and still tasty because of the teriyaki sauce. 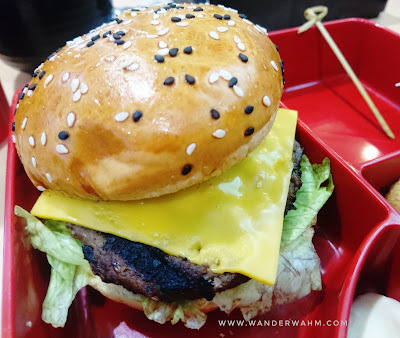 Tokyo Tokyo has revolutionized the burger category with the Wagyu Cheeseburgers. Savor the taste of premium beef with ¼ pound Wagyu Cheeseburger – 100% locally-raised wagyu, fresh lettuce, sliced cheese, and special sauce, sandwiched in a soft, buttery brioche bun. 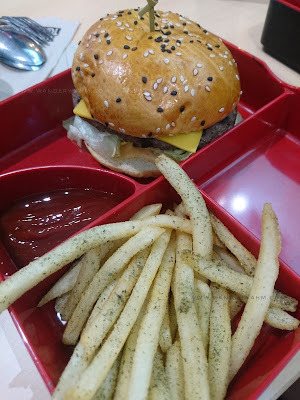 I got to taste their burger for the first time and it taste good actually. Similar to one of my favorite burger in town. An iconic Tokyo Tokyo snack! 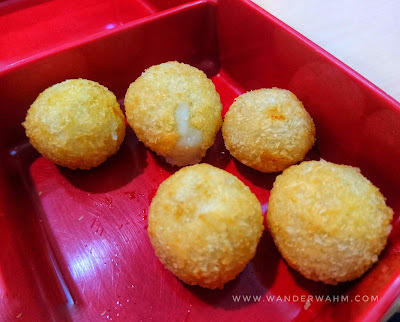 Potato balls are made from soft mashed potatoes rolled into bite-sized balls covered with Japanese breading and paired with Tartar sauce. I didn't expect for this one. I thought that the plain potato balls was not a hit but surprisingly it is much better with potato mash after all. 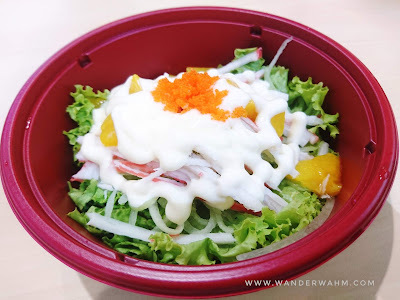 A light, vegetable salad with a combination of kani, cucumber and Japanese mayo in a bed of lettuce. Though I am not a fan of salad and vegetables per se, their Kani Salad is a perfect appetizer before you take on the main menu or before you order a bento. Fries with a Japanese twist -- golden and crispy french fries sprinkled with nori wasabi. This one is a must try too. 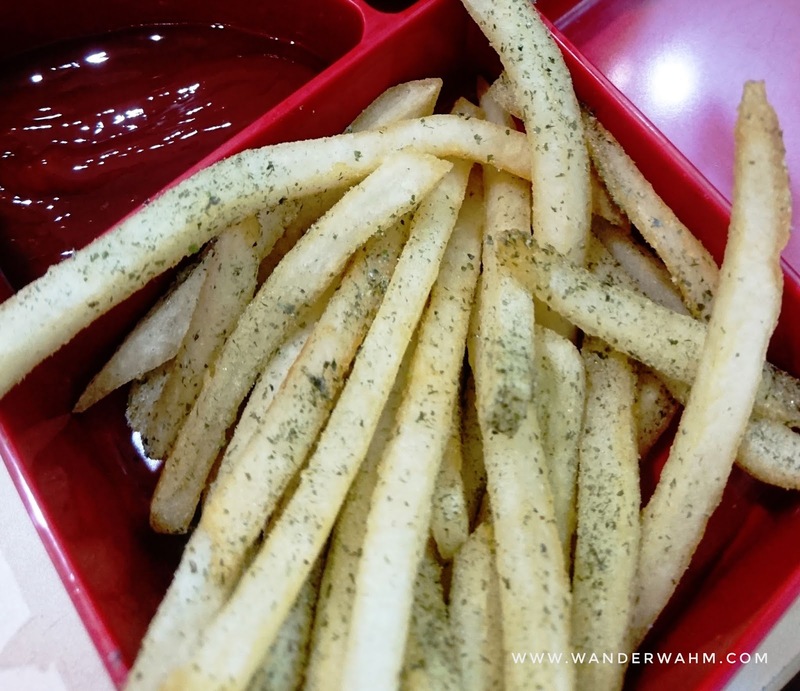 Wasabi is known for it's distinctive taste but the Nori Wasabi Fries is not that bad flavor afterall and no foul wasabi taste in every bite. Actually, it taste just similar to a light sour and cream flavor. 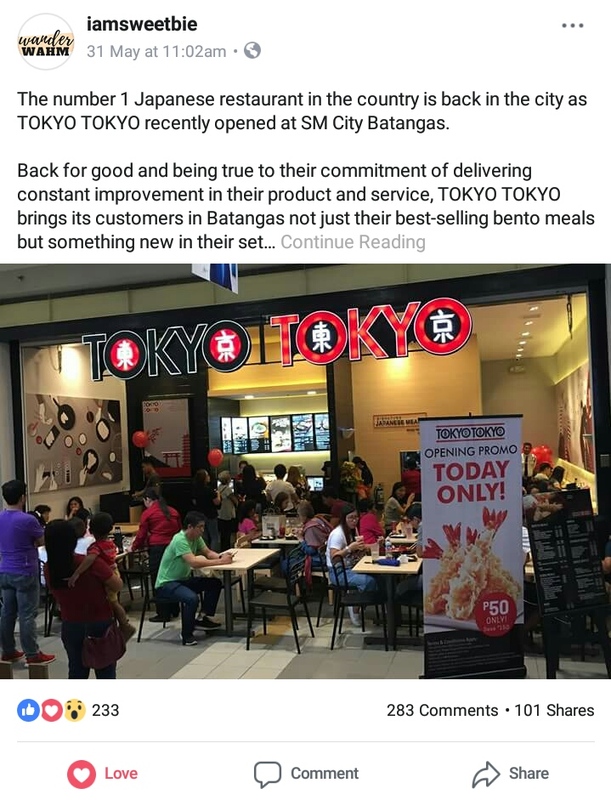 See how people of Batangas reacted when they heard the good news that Tokyo Tokyo is coming back in town. There's still more in the menu board but of course do not ask me for them in just one sitting. 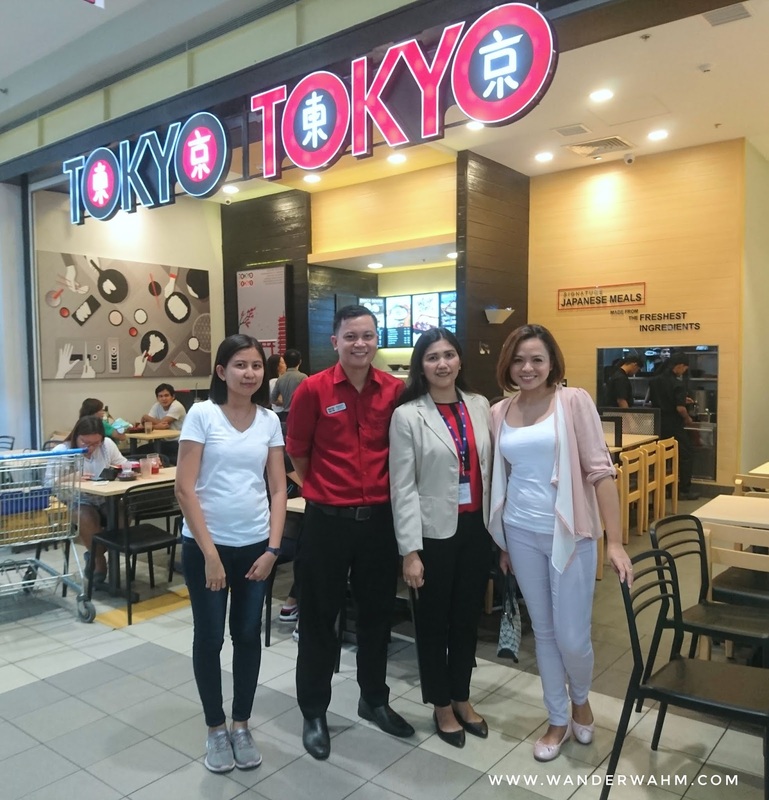 I am telling you that I am a fan of Tokyo Tokyo and if I will have the chance to taste them all? Surely I will make a deal with you. But for now, those are the foods I've tried so far. I'll update you guys on my next visit at Tokyo Tokyo. 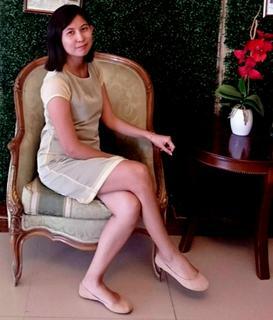 All thanks to Ms. Lea (SM City Batangas) and Ms. Wendy (SM City Lipa) for their time to meet me there, and of course for the Operations Manager, Mr. Marvin for welcoming me and for the tokens (ha! they must have known my weakness here, as I have a thing with tumblers). The dine-in experience was sponsored but rest assured that the following review is on my outmost honesty based of course on my experience.